My mom sent me two CDs this week with pictures of my sister and me when we were young. As I was looking at them, I realized there are a lot of stories there that I could write down, and other stories that I need to learn from others, and the importance of writing my personal history. This is a picture I can write a story about: My sister, two cousins and I are getting ready for a quadruple date. We were visiting in Arizona (where we had lived previously) so my sister and I invited boys we knew from a few years before. I asked Lafe because I had a crush on him when I was in junior high. I later found out he was dating one of my best friends from Arizona (who I apparently hadn’t kept in touch with), and they later married. I remember that detail, but don’t remember what we did for our date. While this scene with my cousins only occurred once, countless similar scenes played out with my 5 sisters and me at home. I am the oldest, so it was usually me and the sister dressed in blue who were getting ready, while the younger sisters watched and/or helped. 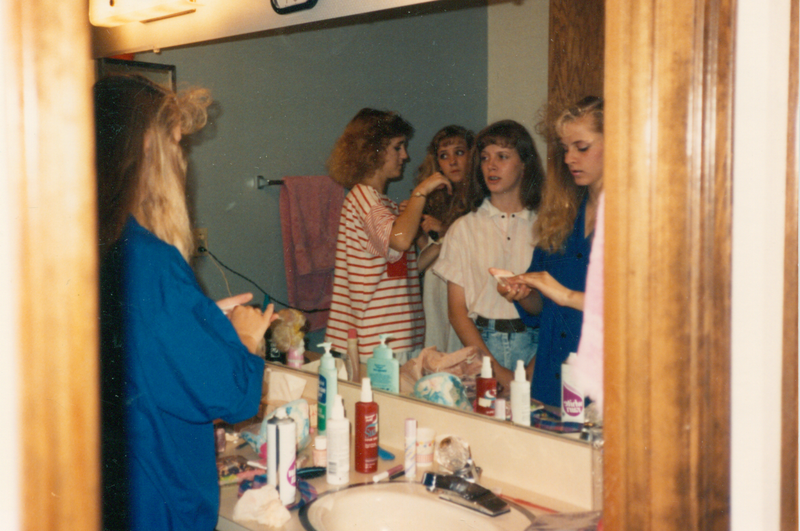 Our bathroom at home was tiny, but there was such excitement was we got ready for dances and dates. [Thinking further about this could lead to stories about sharing the bathroom when 3 of us had to get ready for early morning seminary, to some of the boys that we dated, church dances we attended, etc]. These stories would be improved if I solicited my sisters and parents to share their memories too, so there is a more well-rounded and well-remembered story, since we will remember different details. This is a picture where I need help telling a story. 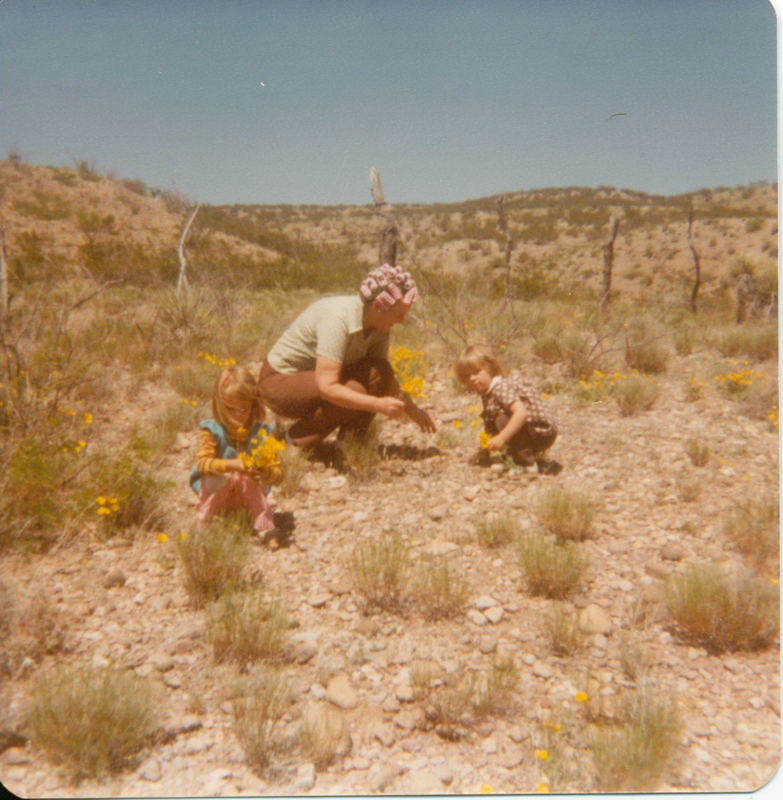 This is the same sister and me, this time with my grandmother, picking poppies by the side of the road in southwest New Mexico. My grandmother died when I was only 11 and since we lived far away, I don’t remember her as well as I would like. I have questions about why she loved poppies and why she went out with foam rollers in her hair. Not that I care, but most women wouldn’t want to be seen in public with curlers in their hair. I asked my mom and, while she doesn’t know the exact details of when this picture was taken, she guessed “that it was a beautiful Saturday afternoon, my mom saw the flowers, stopped the car and took her little granddaughters poppy- picking . She was great at making impromptu, fun memories.” I have several aunts and uncles that I can ask, just to get their guess and their perspective, again making a well-rounded, detailed story, or in this case, a potential story. Both of these pictures reminded me that I need to write my own personal history, and seek out the memories of others to bring in all the details and perspectives. The best time to do this is now, while my parents, aunts and uncles are still alive. Too often, we focus on fleshing out our ancestor’s lives, but forget that we too will someday be somebody’s ancestor and we can help them by leaving them our life story. My homework assignment is to ask my aunts and uncles about what they can contribute to what was going on in the picture with my grandmother, as the first piece of my personal history. What is your homework assignment? My earliest memory is sitting on the basement stairs and laughing at my dad as he is trying to catch frogs in a bucket. They keep jumping out and I think it is so funny. It’s kind of a vague memory and that is all I remember. My own memories make for an amusing story, but leave more questions unanswered than are answered. The biggest unanswered question is why the frogs were in our basement. I don’t know the answer to that from my memory. After discussing with my mom and dad I have a much fuller picture. When I first brought it up to my dad he remembered the event but said there were no frogs, only tadpoles. I remember frogs so was fairly insistent that jumping frogs were involved. Luckily my dad is a good journal keeper so he went back to his journals. There were frogs, although he didn’t write anything about them jumping. This journal entry is from August 4, 1975. “Also caught a whole bunch of frogs in the basement. The packers will be here tomorrow and the movers on Wednesday. Then it’s home Utah here we come.” Here is the fuller story revealed through another peek into my dad’s journal earlier in the summer and the collective memory of my parents and me. My dad joined the Air Force as a medical tech, in part to avoid being drafted. He served at a military base in Montana and my parents bought a house there. We lived close to the Missouri River and because the water table was so high we had a sump pump to keep the basement from flooding. In August of 1975 my father was released from service and headed back to BYU to work on a master’s degree. As part of trying to clean up the house and sell it he mentions painting and working on the trim, and getting the frogs out of the basement. Why were the frogs in the basement? In June he wrote about some severe flooding in the area. It was severe enough that several homes were almost completely underwater. After describing the flooding he writes that “the frogs by the thousands can be heard all night long.” Our home was fine and we were not affected by the floods, but the explosion in the frog population affected us. On the day my dad wrote in his journal, baby frogs started coming out of the sump pump into our basement. There were at least 20. My dad caught the frogs in a bucket or paper sack, and I had my own little plastic bucket on the stairs. By having the date that this occurred from my dad’s journals, I can tell how old I was (I turned three a few months later). My mom said that she let me save a couple of frogs, but they died pretty quickly and we had to throw them out. I share this story to show how you can flesh out your own memories by talking with other people who participated who might remember things slightly differently. By putting together all the accounts you can come up with a more full story of what was really going on. You can still separate your memories from those of other participants, especially if they have very different memories of the same event, while keeping the context of the larger picture. What are your favorite memories, or first memories? How has talking with others about those memories helped expand them or give you a sense of the bigger picture?